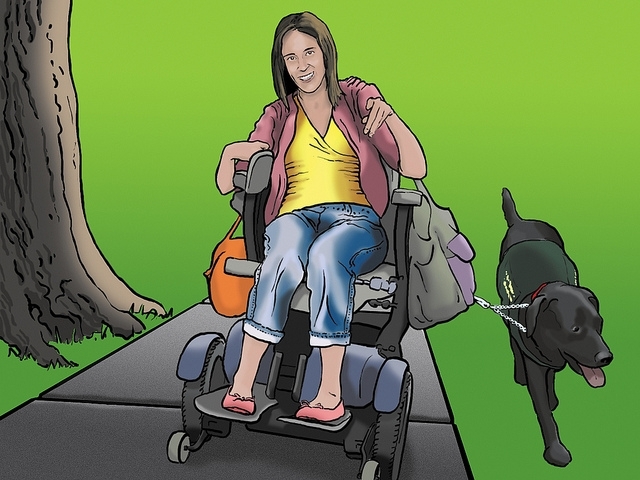 In this section, we review how to add accessible links to content. Links include weblinks, links between different chapters of a book, links within a chapter, and links to attached files. A link (also called a hyperlink) is found in a file, document, or web page that redirects the reader to additional information found in another online location such as a new web page; links are typically activated by clicking on a highlighted word or image on the screen. Why are you including the links you have selected? Generally, links are included within content to point the user to additional information that is available at another location. Links between different parts of a book are also used to facilitate navigation. 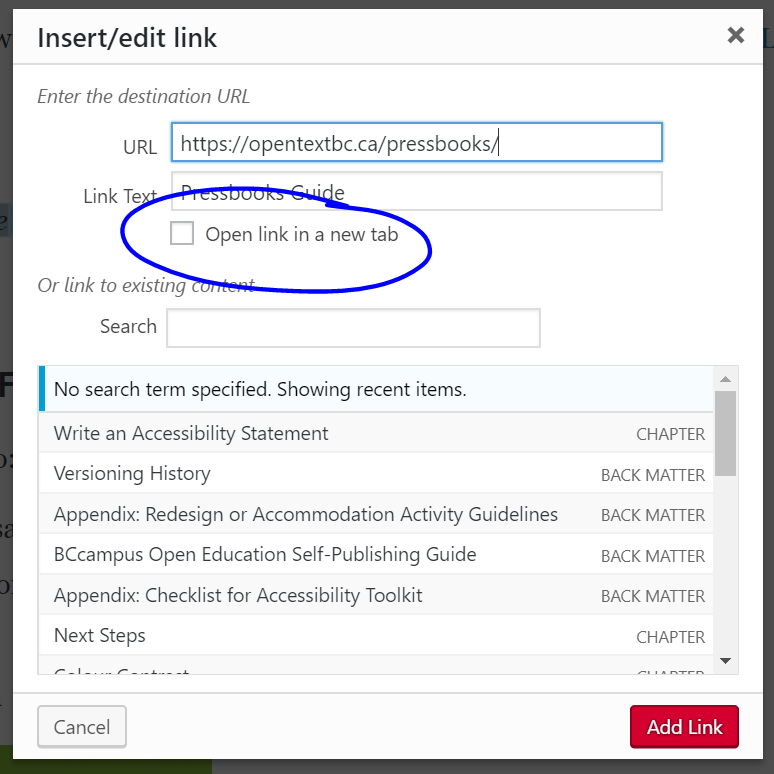 For a detailed description on how to link to material in Pressbooks, see Hyperlink Material in the Pressbooks Guide. Links can be helpful. But, like other non-text elements, they must be assessed for how students with a range of challenges can and will access them. Understanding and attending to these needs through descriptive text, proper link opening, and—when needed—a web address will ensure that all students can benefit. You need to ensure that all links have text that describes the topic or purpose of the link. This is important because people using screen readers might have their screen reader set to read out the text for each link on a page. As such, the link text must describe the content of the link when taken out of context for the surrounding paragraph. While link texts such as “click here” or “read more” will make sense to sighted users, they mean nothing when read on their own. Example 1: Click here for information on BCcampus Open Education. Example 2: You can find more information on BCcampus Open Education at http://open.bccampus.ca/. Example 3: Information on BCcampus Open Education is available online. While the first two examples make sense in the context of the sentence, neither link text describes the purpose of its link. While the second example is better than the first, having the web address as the link text still does not make the purpose of the link clear. The third example is the most accessible. If you want to link to something that isn’t a web page—such as a Word document, Excel file, or PDF—you should include this information in the link text. This is important because it informs the user what will happen when they click on the link, thus preventing confusion. In addition, a user may decide not to click on a link if they know it’s a certain file type. This typically happens when a user doesn’t have the software needed to open the file, or when they know the file type is inaccessible to them. The default setting for links in Pressbooks is that they not open in a new window or tab. This is the preferred behaviour, since a new window, opening unexpectedly, can be disorienting for people. This is especially true for individuals who have difficulty perceiving visual content. However, if a link must open in a new window or tab, the best practice is to include a textual reference. Example: Information on BCcampus Open Education [New Tab] is available online. Click on the link and select the PENCIL icon (edit). Select the GEAR icon (link options). One thing to keep in mind is that most open textbooks have a print-on-demand option. For that reason, it is a good idea to provide the web address for external links so people using a print copy of the book can find the online content. You can do this by including the web address in-text (Example 1), providing the web address in a footnote (Example 2), or by providing a list of web addresses on a single page in the back matter of the book (Example 3). Example 1: Information on BCcampus Open Education (https://open.bccampus.ca) is available online. Example 2: Information on BCcampus Open Education is available online. Example 3: Information on BCcampus Open Education is available online (Note: If you are using a print copy of this book, please refer to the “List of Links” chapter at the end of the book). Links by BCcampus is licensed under a Creative Commons Attribution 4.0 International License, except where otherwise noted.